The Striped Marlin (Kajikia audax) named “Mary” (Tag ID: GFR6750) was originally tagged & released by angler James Hollingsworth on February 3rd, 2016 while fishing with captain Rosendo Gomez and mate Abraham Castro aboard the charter boat Tiburon from our Official Research Center, Pisces Sportfishing (http://www.piscessportfishing.com/) out of Cabo San Lucas, Mexico. The Striped Marlin was estimated to be 110 inches (279.4 cm) total length and had an approximate weight of 150 pounds. The Striped Marlin was recaptured 32 days later on March 5th, 2016 by angler Capt. Erick Esteves and mate Sergio Castro aboard the Handy Man panga boat out of San Jose del Cabo, Mexico. 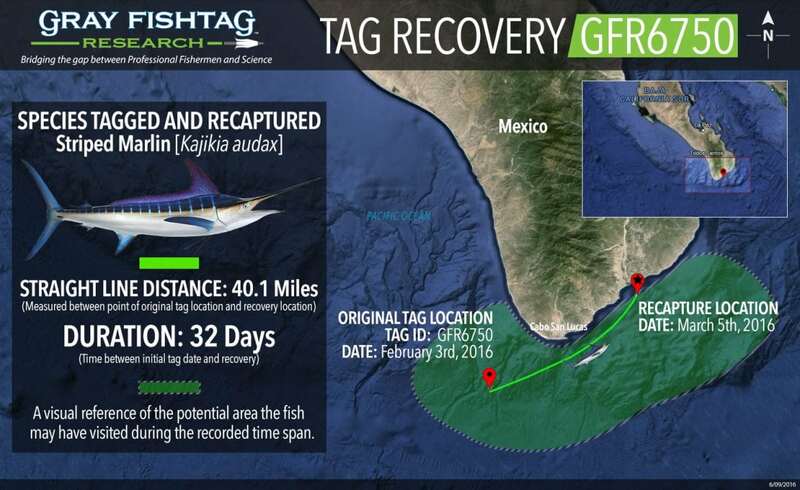 The recapture location was approximately 40.1 miles (64.6 km) away from the original tag location. During that 32-day time period, the Striped Marlin most likely stayed in the local waters just offshore where the food source was plentiful. That area is ideal habitat for Striped Marlin with the numerous ocean floor canyons which produce nutrient rich water from upwelling. That rich water is home to an abundance of small fish, such as mackerel, anchovies, sardines and squid, which is a food source for the Striped Marlin. At the time of recapture, the Striped Marlin had an estimated length of 115 inches and weight of 167 pounds. Striped Marlin are a highly migratory, large oceanic fish with a long rounded bill. They exhibit a bluish-black to blue/silver dorsal coloration with a silvery white underside and about 15 rows of cobalt-lavender vertical stripes running along each side. The high pointed first dorsal fin, which usually equals or exceeds the greatest body depth, is a distinguishing characteristic. Striped Marlin can reach a maximum size of nearly 12 feet and greater than 450 pounds. They are not a dense schooling fish, but can occur in small groups. Striped Marlin is the most dominant and widely distributed of all billfishes. They are found in both Indian Ocean and Pacific Ocean waters with greatest abundance past the continental shelf. They are generally caught close to shore only where ocean floor drop-offs or canyons occur. The waters off the southern tip of Baja, Mexico to Manzanillo, Mexico is an area of high Striped Marlin abundance and supports a large recreational fishery. Striped Marlin is a highly prized recreational sportfish species. The Tiburon charter boat crew will receive some Gray FishTag gear for their tagging efforts. Captain Erick Esteves will receive a pair of Costa Del Mar sunglasses, a Tag & Recovery Certificate, and Gray FishTag gear for reporting the tag recovery.